I've written about this before, but a very useful tool when reading emails is to hover over links and check them out before clicking. This also works on web pages. I recently received this email apparently from Google asking me to view a notification. 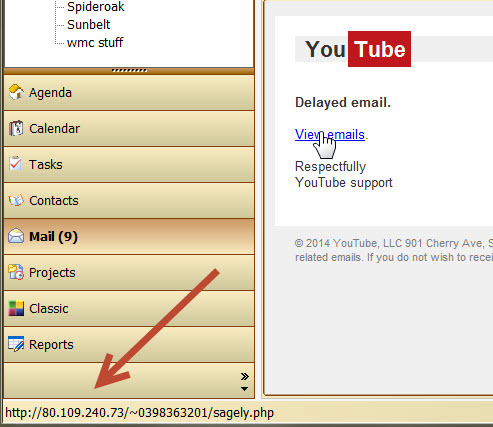 Pointing to the link and hovering revealed the IP address in the lower left corner of my email program. The first thing to notice is that rather than use the Domain name, they used an IP address. Google would not do this. 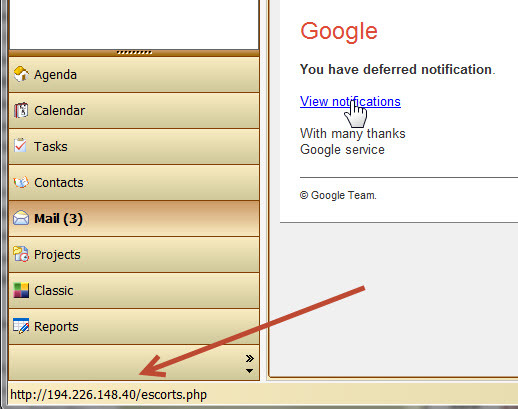 Also, it seems to be running some php script called "escorts". Also, unlikely to be Google! Using a free IP lookup service (http://tools.whois.net/whoisbyip/) I found out the owner was Anton A. Vasyanin in Russia. Probably not Google. My second example seems to come from YouTube. Hovering reveals another address that is obviously not YouTube. It actually belongs to someone in the Netherlands using a Host from Austria. I've also seen a technique where they made it appear legit at the beginning and then had so much in the link that the actual destination was off the page and could not be seen. Some odd results appear when a legitimate Email service like Constant Contact which I use for my Newsletters display links. They include information that allows the Newsletter owners to see who clicks on which links and how many times links were clicked. I use this to see what articles are really being read and what my readers like. Sometimes I write an article I think is great with an important link that gets very few clicks for follow up. Other times people click a link I didn't think would be popular. This helps me better respond to my readers. Now I know that the Fun Links is my clients' favorite section.